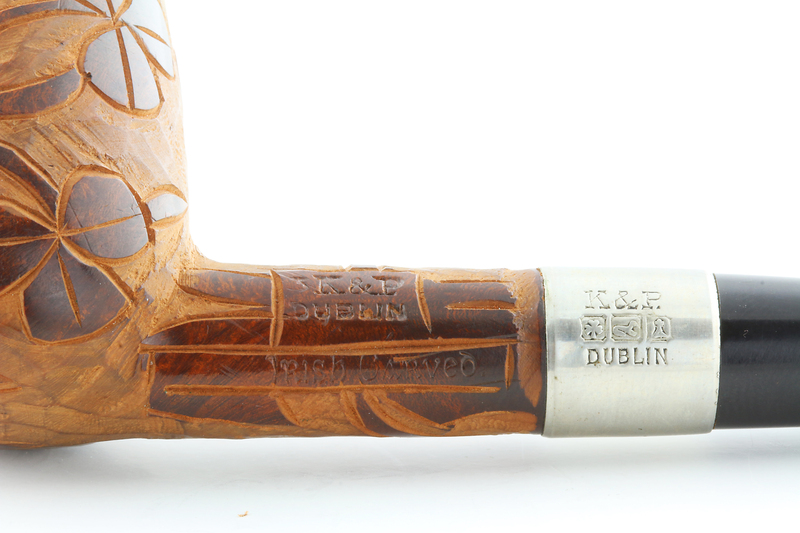 Irish Emblem pipes, known in the 1896 catalog as “Irish Carving Shamrocks” and in the 1906 catalog as “Irish Emblems,” are scarce and were carved in the factory at Lion Street and later St. Stephen’s Green, as well as sometimes being outsourced to local artisans, perhaps into the 1950s. While carved in all grades, typically they are seen on the estate market in either the 3rd grade System or the 101straight billiard. The emblem on the front of the bowl was usually a harp, although both the wolf hound and round tower could be ordered. The 1896 catalog actually illustrates a pipe with all three emblems, although the vast majority of pipes simply feature the Irish harp. The significance of the three emblems lies in their deep ties to Irish culture: the Irish harp (the Brian Boru or O’Neill harp) is seen on Ireland’s heraldic emblem. The Irish wolfhound was a breed developed for hunting and guarding. The round tower is a paradoxical or as contemporary spiritual practitioners would call it, non-dual place of peace and power, signifying Ireland’s unique Celtic religious heritage. All three emblems were stamped on the nickel mounts of Peterson pipes from 1896 until about 1963. When we were at the Chicagoland Show last May, as my wife and I were walking through the tent on the morning of the swap & trade event, she handed me a Peterson to look at. 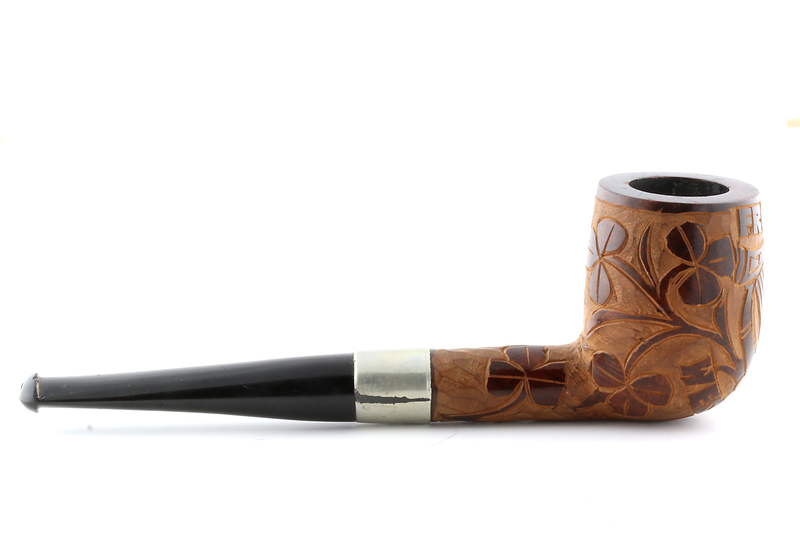 It turned out to be the oldest Peterson “Irish Emblems” pipe that we have so far documented, going back to the Irish Free State Era (1922-1937). 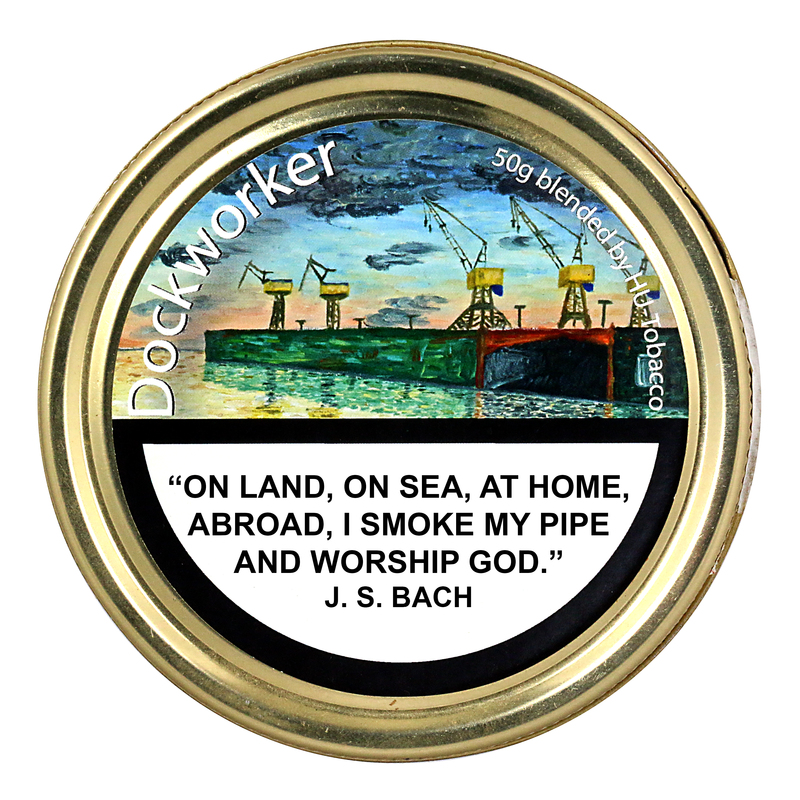 One of the things that was so unbelievable about it was that it was still unsmoked. Unsmoked Petersons are easy to identify, unlike some other marques, because of the chuck marks inside the chamber. It seems to be a kind of unspoken identification tag for Peterson, and as far as we can tell, it goes back to the beginning. Not only did it have its chuck marks, but the remnants of a paper price tag—typical of the era of brick & mortar pipe shops—is in evidence. The clean mortise also gives testimony to the pipe’s unsmoked condition. I can only imagine how labor-intensive these were to carve. Think of the time spent on the best sandblasts you’ve seen—J. T. Cooke’s, perhaps. Now look at the detailed knife work here. Did it take as long? I don’t know. I do know third grade briar was typically used, because the grain was not an issue and would not be visible. 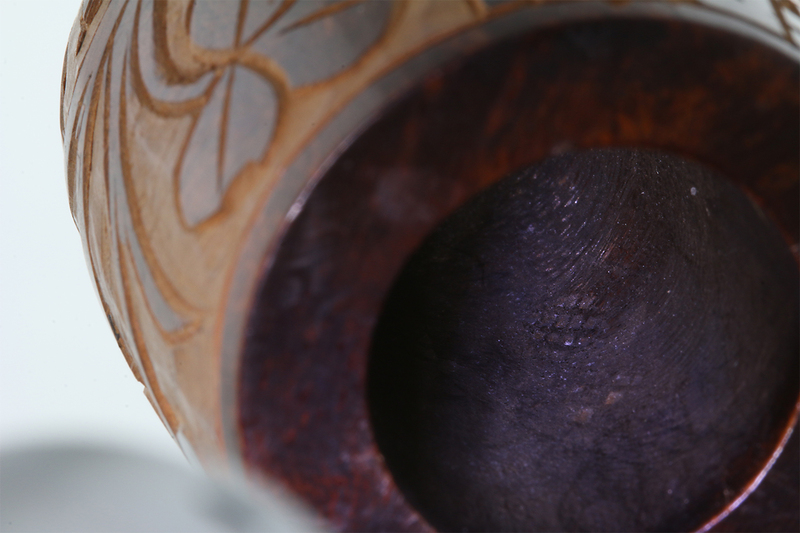 The bowls were stained fairly dark to highlight the chiseling of the carver. Many of these pipes feature Irish county names below the front emblem or in a phrase above and below it, as on this pipe (see PPN #77, “Crossmolina” for another Irish Emblems story). I can only hypothesize that a Westport tobacconist ordered several of these from Kapp & Peterson for sale in his shop. 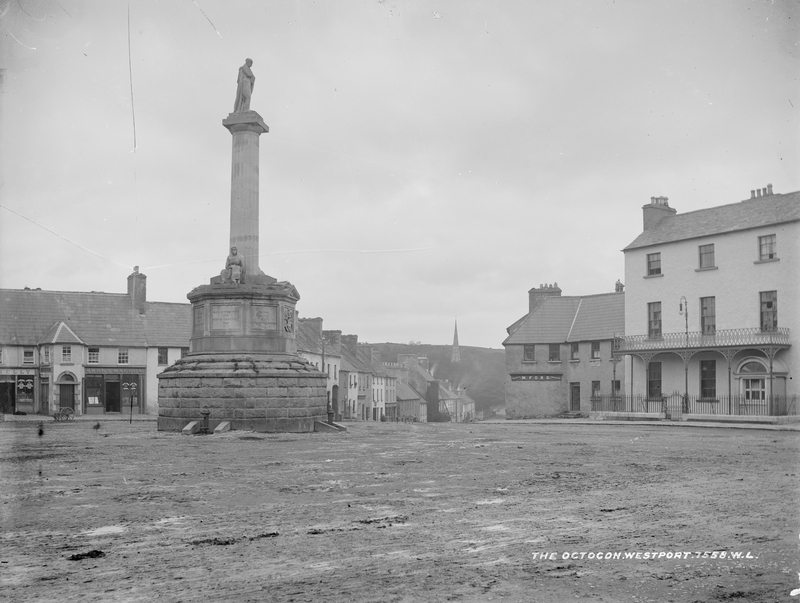 Westport, known on the internet these days as “Destination Westport,” lies at the southeast corner of Clew Bay and owes its perennial popularity as a tourist town because it lies about five miles from the famous pilgrimage spot, Croagh Patrick. 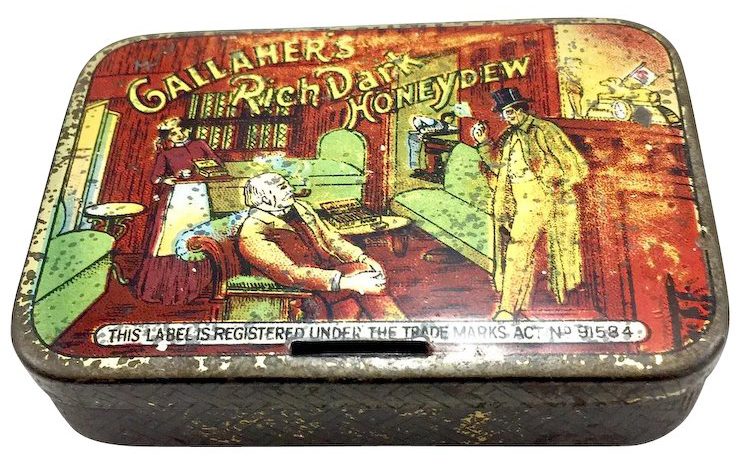 Both tourist and pilgrim have ever shared a natural-enough desire to bring back a bit of something from their visit, and I can imagine a pilgrim either before or after he ascended Croagh Patrick stopping in a Westport tobacconist’s shop, perhaps to replenish his supply of Gallaher’s famous Rich Dark Honeydew. Espying the Kapp & Peterson pipes and simultaneously noticing this very pipe and the money in his pocket, the pilgrim asked to see it. If it was, as I suspect, rather expensive, he probably took it home fully intending to smoke it, but never quite got around to it as a bit of a sacred relic. As Neil Archer Roan once remarked in one of his great A Passion for Pipes blogs (and as I have observed in my own life as a pipeman), this is not an uncommon experience with expensive pipes. 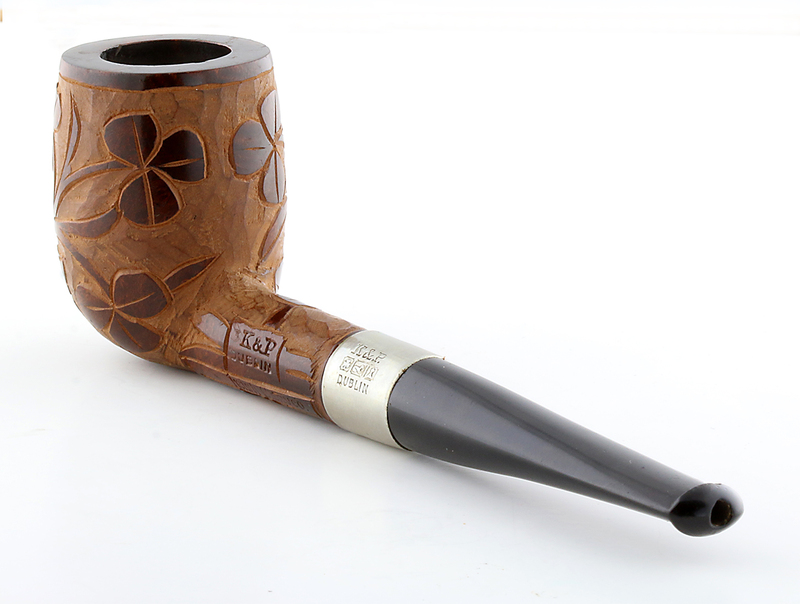 The 101B (tapered stem) billiard is first seen in the 1906 catalog and has been in continuous production ever since, although it’s not seen as frequently as many other shapes in the catalog. 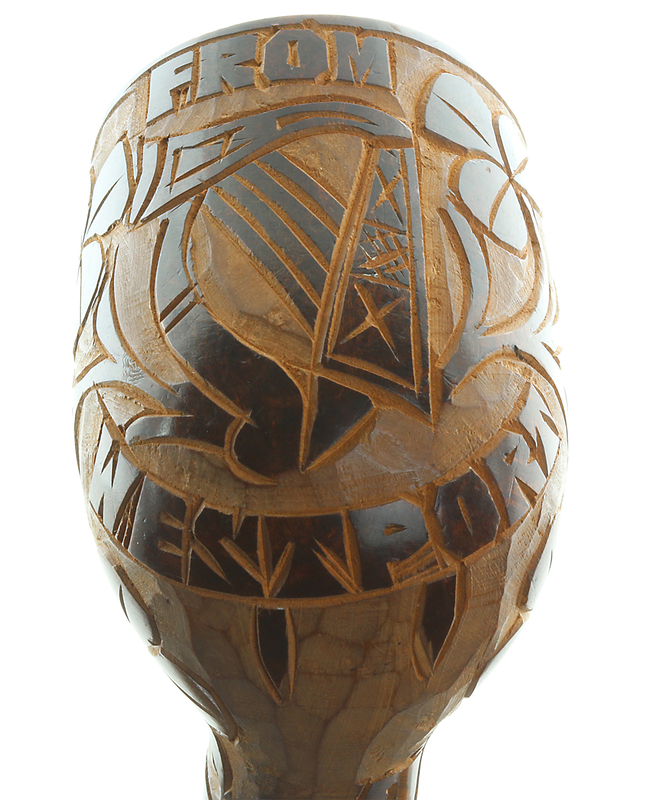 As you can see, it is stamped on the obverse of the bowl as K&P over DUBLIN over the unusual [Celtic] Irish Carved, suggesting Westport in the 1920s hosted international as well as Irish pilgrims. The nickel ferrule features the maker’s mark K&P. [period after “P”] over Irish Emblems nickel marks over DUBLIN. Both the orifice-style mouthpiece and the early nickel marks (identical to those used on the IFS nickel wind cap pipes) confirm it as from the IFS era (1921-1937) when non-P-Lip mouthpieces first came into production. The nickel marks feature a distinctive high-necked wolfhound not found in iterations from the 1930s and 40s. The nickel band was silver-soldered (the silver solder being visible unless the ferrule is highly polished) by hand, and the band turned-down by hand on both sides to meet the bowl. 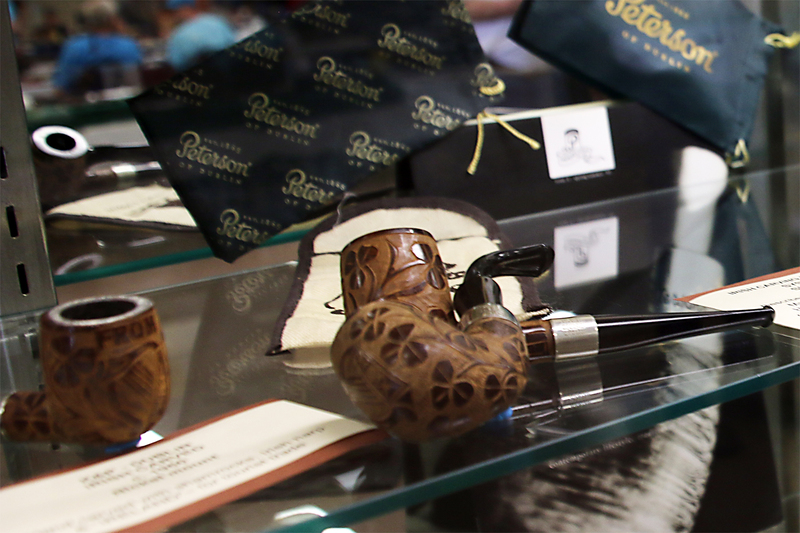 We were so excited by the find that we featured it as part of a trio of Irish Emblems pipes in the display cases at the front of the exhibition hall at the 2018 Chicagoland Pipe & Tobacciana Show, in conjunction with a presentation about the forth-coming book. Bowl Height: 1.86 in./47.32 mm. Chamber Depth: 1.58 in./40.30 mm. 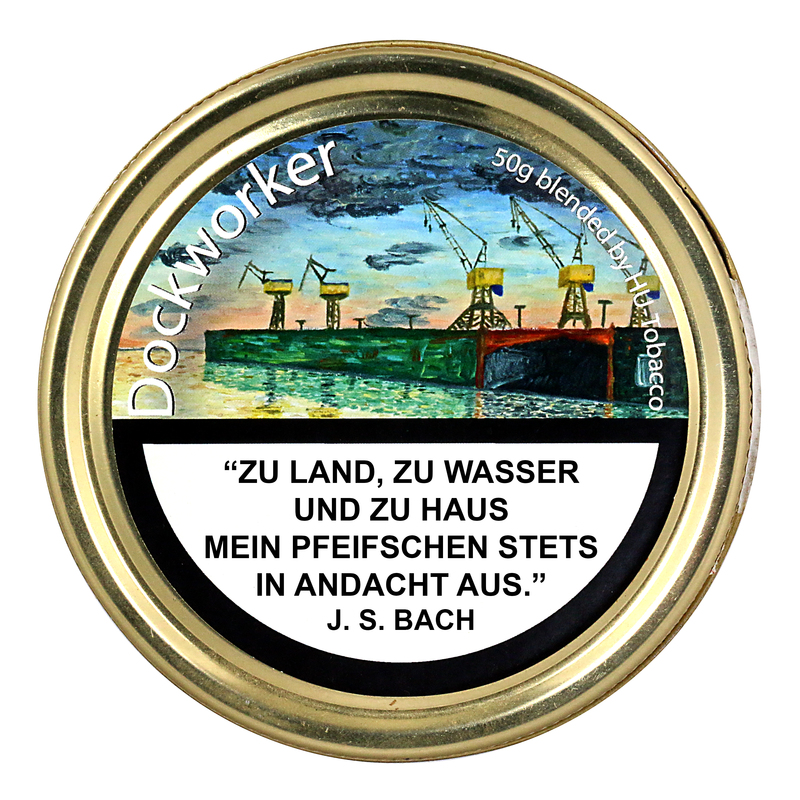 Chamber Diameter: 0.754 in./19.12 mm. Westport, we used to go there before they put me on the pills.The first time it should have been for two days, it ended up with a week and we returned back in about ten years. Jorgen, you went there on pilgrimage? Still have any tobacconists in Westport when youw went either time? One other comment. I recall purchasing a carved Peterson from Barry Levin some years ago when I was heavy into collecting estate Petersons. I don’t recall what the carvings depicted and traded it away sometime later. I didn’t know the history of these pipes. I guess I should have done some research. I was fascinated at the time by the carvings. These are a peculiar piece of Peterson’s history. At first, I believed they were all made by the same carver. But when I look at the documented pipes in Photoshop, they may have the exact same shamrocks, leaves, and harps, but the carving style itself–the way the wood is chiseled out–is different on each one! No,we are cultural protestants but we have been up Croagh Patrick. It was hard to come down. There was an old pub at the foot – the man looked like a pirate.. There was a newsagent who also stocked some Petersons. I have brought two Kapets there, 221 and 80s.